Botanically rhubarb is a vegetable but it is most often eaten as a fruit. In some European countries it is cooked with vegetables and meats, but we tend to follow English traditions and serve rhubarb as a fruit in desserts and puddings, and to use it in chutneys, relishes and jams. 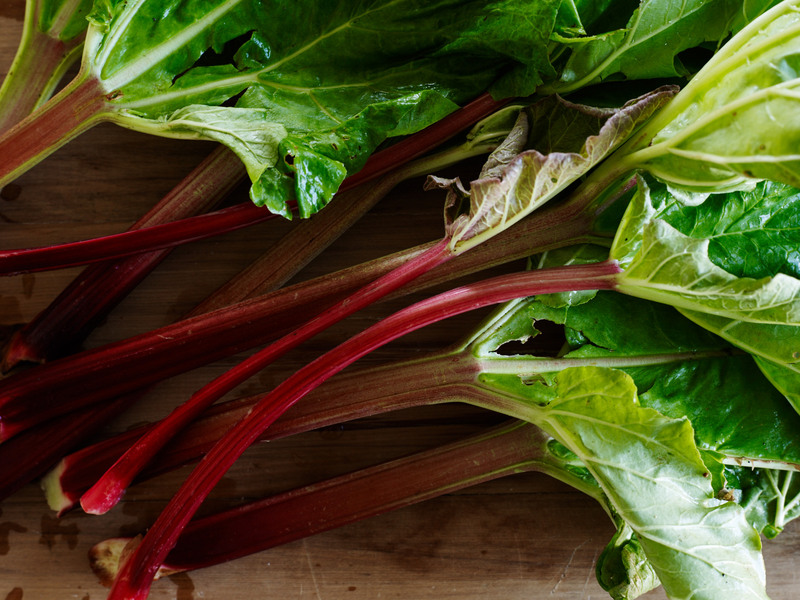 Rhubarb has been used for medicinal purposes for thousands of years, but in truth, it would be much better for you if it didn’t contain oxalic acid because oxaclic acid, also found in spinach and sorrel, hinders the body’s absorption of rhubarb’s plentiful supply of calcium and iron. But there’s plenty of fibre to be had in the stalks, along with potassium and a good dose of Vitamin C, so it is still considered a healthy fruit. In Italy it is made into a health tonic called rabarbaro and served after a meal as a digestive. It’s an acquired taste. It’s easy enough to grow and fairly hardy but you’ll give the plant a good start if you avoid picking the young stalks and let the plant grow on for a year to encourage strong growth. In New Zealand and Australia it is available all year round, although the stalks are thinner and redder in winter, and fatter and greener and more tart in summer. In northern climes it is most popular in spring and again in autumn. If you grow your own rhubarb, twist the stalks at the base and pull them away, don’t cut them of the plant, because they will keep fresher like this, and trim away the leaves straight after picking because they tend to draw moisture from the stalks and make them whither. The stalks can be harvested individually, a few at a time, or all of the stalks can be taken in one picking. Most gardeners advise not to compost the leaves because they are poisonous, but not as is commonly thought due to the presence of oxalic acid, but rather due to an unidentified toxin. As we don’t eat raw compost, we shouldn’t worry, as the oxalic acid and toxin break down during composting. If you don’t grow rhubarb, here’s what to look for when buying it: Go for uncut stalks that have been pulled from the plant. The ends of the stalks should be fleshy and firm and not feel slimy. The stalks should be firm to the cut tips, not spongy or withered. Look for red stalks, rather than those with too much green, because red stalks are sweeter and less astringent. Size is not a guide – big stalks can be just as tender as thin ones. When you get the rhubarb home, lop off the tops of the stems, give them a good wash and dry then transfer to a plastic bag. Store refrigerated for up to a week. Rhubarb can be frozen. Cut it into short lengths for convenience, freeze spread out on trays, then transfer to a sealable plastic bag and return to freezer. Cooked rhubarb also freezes well. 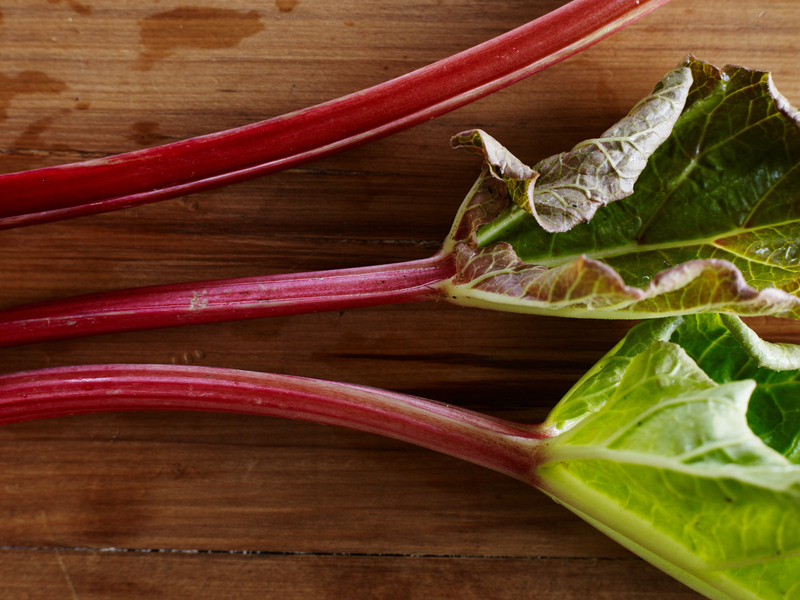 Rhubarb has a sharp sour flavour and needs sweetening to make it palatable. Try sugar, white or brown, honey or redcurrant jelly. Rhubarb and ginger are a culinary legend, and it takes on an exotic air with spices such as cinnamon and vanilla. It’s excellent with strawberries, plums and white peaches. Raspberries enhance the pretty pink colour and orange gives a fresh clean fragrance. Perhaps it is best-loved with apple because its tartness gives a bland apple pie or crumble a real boost. 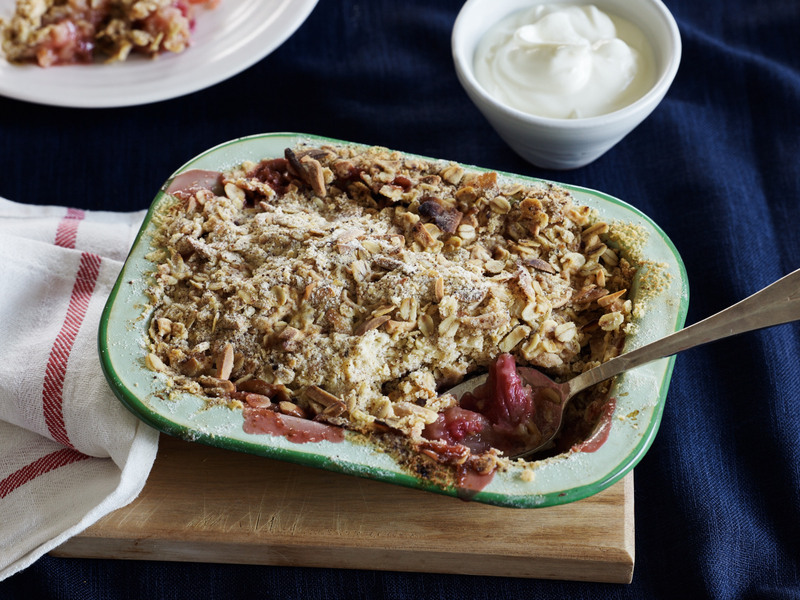 Rhubarb, Apple & Ginger Crumble Rhubarb is also delicious with cream, ice cream and mascarpone, and it works with bland soft white cheeses such as ricotta and honey-sweetened yoghurt, too. But I’ve saved the best until last – rhubarb and custard. It’s divine in any shape or form, alone, or with pastry, crumble, sponge or biscuits. If rhubarb appears stringy, run a vegetable peeler along the edges of each stalk to remove strings. Wash well, then cut into short lengths. 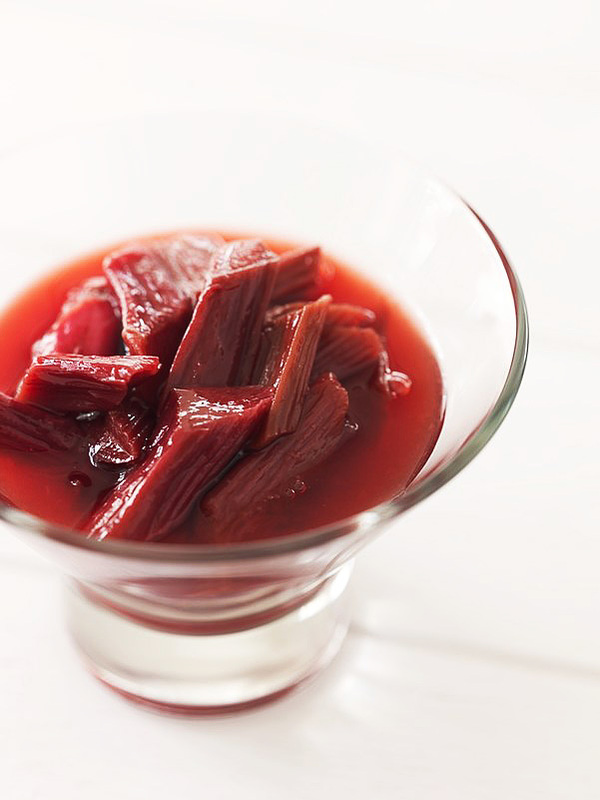 Rhubarb is full of moisture and can be cooked with just sugar to sweeten and no added liquid, though I find a little redcurrant jelly and orange juice enhances the flavour and colour and forms a pretty pink syrup. If you want to keep the pieces intact, cook as described here. If the rhubarb is to be turned into a purée, cook it for an extra 10 minutes, drain, then squish it to a purée with a fork. Alternatively, cook it gently in a covered stainless steel saucepan for about 10 minutes, until it turns to a purée. Wash and trim 400g (about 14 ounces) rhubarb and cut into short lengths. Put rhubarb in a shallow baking dish and sprinkle with 75g (2-3 ounces) sugar. Cover with tin foil and bake in an oven preheated to 190°C (375°C) for 15-20 minutes, or until it is just tender (after 15 minutes’ cooking time, check rhubarb often because it quickly blows open and turns to mush). Drain rhubarb in a large sieve, reserving syrup (it’s lovely with muesli), unless serving in the syrup. Avoid cooking rhubarb in aluminium saucepans because it will discolour, and if using tin foil when cooking rhubarb remove it as soon as you take the rhubarb out of the oven; prolonged contact with foil can produce an unpleasant taint (the steam from the rhubarb collects on the foil and drips on to the rhubarb as it cools). Always use a stainless steel knife to cut rhubarb, not a carbon steel one, because carbon steel discolours on contact with rhubarb and gives it an unpleasant metallic taint. I’m thinking of making your apple, ginger and rhubarb crumble this weekend. Could I substitute the 4 Tbsp chopped stem ginger in syrup for ordinary ground ginger? Hi Merrie, what a great question. Yes you could by all means. I’ve sometimes added a pinch of ground ginger to the actual crumble topping to give it a lift. If you want to add it to the fruit, I’d go with less than 1/2 teaspoon. You could also use sliced crystallised ginger. This is so good you'll want to scrape the dish for every last morsel. Get cooking it this weekend, or anytime soon. Dig the spoon in and eat! Get a bit of a Spanish sizzle going on the grill for a tasty start to any meal. Yes!